Ambien is prescribed in doses of 5 or 10 mg, taken once daily. More on Ambien dosage, cost, and prescriptions here. Ambien (zolpidem) is an anti anxiety medication used to help manage mood disorders and insomnia. How does Ambien work in the body? By slowing down brain activity. This is why you need a prescription in order to get Ambien. Zolpidem is a benzodiazepine-like drugs and is a Schedule IV controlled substance given its potential for abuse and dependence. This is why Ambien is only available as a prescription drug. More here on Ambien prescriptions and we invite your questions about Ambien at the end. 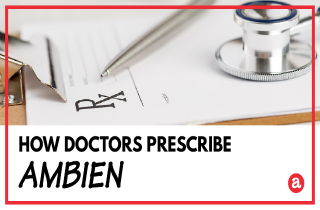 What do doctors prescribe Ambien for? Ambien is a prescription drug that helps improve sleep in people with insomnia, as well as controlling the symptoms of panic attacks and mood disorders. By altering the balance of chemicals in the brain, Ambien causes relaxation and helps remove stress. Because Ambien can also cause euphoric feelings, Ambien abuse is possible and occurs when people use Ambien for non-medical reasons. Ambien is normally only prescribed in doses of 10 mg once daily. Ambien is usually supposed to be taken right before bed, even when it’s not being used to treat insomnia, because of the extreme drowsiness it causes. Some people with a compromised liver or other condition which causes increased drug sensitivity may only be prescribed 5 mg per day. How long is Ambien in body? The body absorbs Ambien quickly, working within 90 minutes of dosing and being reaching its half life in the body within a few hours. At most, Ambien stays in the body for a couple of days until it is completely metabolized. The cost of Ambien depends on your insurance coverage. Brand name Ambien can be very expensive, with some people reporting prices of over $100 for a 30 day supply without insurance. If your insurance covers Ambien, it may be less expensive, but not necessarily by much – $70 is not unheard of. The generic version of Ambien which is basically zolpdiem, is probably a better choice for most people, as it only costs about $20-30 for a month’s supply of the medication. Can you get Ambien over the counter? No. You cannot get Ambien over-the-counter. Ambien is a prescription-only medication. This is due to the potential for Ambien abuse. Anyone taking Ambien needs to be under a doctor’s supervision to make sure it’s being taken safely. The signs of Ambien abuse can be subtle. If you’re taking more Ambien than prescribed (or without a prescription) in order to achieve euphoric effects, you are abusing Ambien. Sometimes it’s more complex then that; someone with a prescription may have developed a tolerance for Ambien and may take larger amounts simply to get relief from their symptoms. Regular abuse of Ambien (zolpidem) does have its risks. If you become addicted from abusing Ambien, you will not only have physical withdrawals when you stop taking the drug, but you’ll experience compulsions take Ambien regularly, even if it has negative consequences on your personal or professional life. Do you still have questions about Ambien prescriptions? Please leave them here. We are happy to help answer your questions personally and promptly. If we do not know the answer to your particular question, we will refer you to someone who does. I am disabled do to 3 compression fractured vertebrae 1 in my c7, then thoracic t7, and the wire of the 3 is L-5-S1 from falling head first of a condo while airless painting back in March or April 1979 or 1980( memory problem as well.i have been working after that fall for 38 years and I can’t now cause the l1s5 pain Cain be fine when walking and in o e step I’m like crippled this will occur in any given moment and go from one side to the other, sometimes back & ,forth several times a day. All of what I do including simple stuff as sitting on the toilet. So I’m taking zolidem for the problem hurting causing anxiety of having the pain.i had alwY said no to operation for it because I have many friends who had surgery and on or more are nieces men and women. And I was a EMT in 1992 and there are days I am up all night a d switching 20 minutes on gel ice packs and heat pads but the worst of all is jumping out of bed dreaming with muscles sticking out of my legs where I can’t stand straight up and I was taking Soma’s till the government stopped that, I still get them just not as frequently, my wife had to move out of our bedroom over this.my father had this muscle spasms the same way when I was a young boy and looking at him suffering like that made us 5 kids cry, cause we were to young to know what to say, and it was after 1998 he passed away. Drove semi for 50 years. No doctor was ever found the reason but in there looking found that my triglycerides were 4400 then(98) and Soma’s would get rid of spasms quickly so I would put on on the night stand so if it happened I could do anything but get out of bed and try to stand and walk it off. Man I now know what he went through and so happy that mine are not as severe anymore(so far) mite be because I don’t work anymore, I ran a Hugh printing press 44 ft long 10 colors and 99 % of the time you set up turn press on and run to the end registered it through the 10 and at the viewing station was a 1 foot 10 foot long you had to jump on and then jump off. And all this time from my fall no doctor told me about my back, till 98 when my primary ask me after an MRI what kind of accident was I in. I then explained to him about the fall 15 years before. And he told me that my spine had scoliosis and about those 3 vertebrae, and no wonder I had this problem, ever since I had nightmares and serious night sweats, and that I am a diabetic. So now although I still have a lot of nightmares I am used to it but the back is my biggest problem and I’m 61 in a couple months. Sorry about the lengthy if my story but they took away the Soma’s and no get FLEXIRLL and really there a joke I yawn and can’t talk because it makes my mouth super dry and to much water can make you cramp, but I just get up about every two hours to urinate, drink some more water. I was rush to hospital from to deleted blood from drinking to much water. So as you can see I am just trying to help myself by asking questions, doctor spend more time on the computer now and there not hearing what people are telling them, I love the doctor I have and I’ve seen many and he’s the only one who has helped me Dr. Giovanni, but any help would be appreciated, not working anymore, but I still go to work and it’s a nightmare and sometimes it’s just another day there in 9 years I used to be a machinist from 17 to 8 years but printing I never got awarded anything till printing and got 20 excellent work or production. So I was a serious worker and that company moved to Chicago and I went there for the company to help train people up there how to run Even longer an bigger press’s and came back to Florida and at another very small press did the same thin just a shorter press, I called it doing the stair master. But blew the work thru each day. But go cramps at work to just not as severe. Please if possible lead me to someone I haven’t been to, I even did a ton of chiropractic and have my own “Tens Unit) it worked for years till now if I use it, it causes pain and spasms back and all doctors say my bones are degenerated for surgery and I agree. So what kind of hope do I have for my few short years, no male seven uncle’s all gone and none mad it past 68 years for some kind of bone cancer or brain.thank you. My insurance has decided that I can take about two 10-mg. zolpidem a week, and restricts me to filling an RX only four times a year (for 30 per month). I was doing all right for about a year on this regimen, but recently have been taking 1/4 to 1/2 pill nightly. My first question: Can I go back to 5 mg. twice a week without experiencing withdrawal symptoms? So far I don’t think I have. My second question: Can I take 2.5 to 5 mg. every night safely (assuming I can get enough prescribed to do this)? Hi Lynea. I suggest that you speak with a doctor about your concern. hi .. what happen if i use ambien in 5 shots .. can i fall asleep fast ..
Hi Ray. Call the number displayed on the website to speak with a trusted treatment consultants. Hi, Cherry. Ambien is prescribed by a doctor. I have been on 20 /day for years for sleep and pain.It I is the only thing that gets ms to sleep with chronic pain (CPPS). But I would like to cut back some. What is the best way to partially withdraw from. Ambien? Hello Gail. I’d suggest that you call the clinic directly and ask them. If you don’t get a straight answer, you can phone your state attorney general’s office and ask for help investigating the current legal restrictions on prescription medications. Best of luck to you in your search. My Dr will only prescribe (2) 20 pill prescriptions of zolpidem between visits! I have been taking this med for over 10 yrs and I have been with this dr for over 8 yrs. this changed after my Dr(PA) changed clinics. I would like to know if this is a law or just the policy of the clinic to prescribe only 40 pills between visits??? The visits are expensive!! Wondering if I should change doctors.